The best slider recipe combines ground brisket with caramelized onions, rosemary aoili, and sweet Hawaiian rolls! Serve these juicy miniature burgers on soft sweet rolls or brioche rolls and your guests will be more than impressed! Let me preface this entire recipe by saying I am not kidding around about these being the best sliders (or burgers) I have ever made! And trust me, I have made A LOT of burgers! I keep trying to outdo them, but I keep coming back to these babies time and time again! The combination of the incredibly flavorful and juicy ground brisket paired with the sweet caramelized onions and the rosemary aoili just cannot be beat! If you think you have a better burger recipe please send it my way so I can test it! 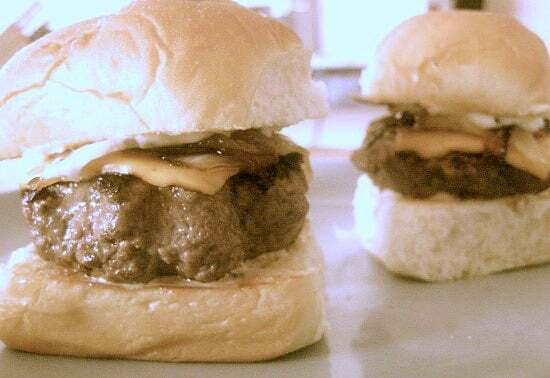 There are 4 main components that make these the best sliders ever! Now you might be asking yourself, what the heck is a ground brisket burger? Or maybe you are even wondering what brisket is in general. Brisket is the cut of meat that comes from the lower chest part of a cow. You can see where the brisket cut comes from in this chart. The most typical ways you might see brisket prepared is smoked and then sliced or pulled. It is also frequently roasted. There are basically two options for you to acquire ground brisket for these sliders. If you happen to have a meat grinder, such as an attachment for your kitchenaid mixer, you can grind it yourself very easily! Just cut the meat into about 1″ chunks and feed it through the smallest dye on your grinder. Or, the easier way, is to ask the butcher at your meat counter to do this for you! Note: I have also made these burgers with 85% ground beef and they are still amazing! I do really love how flavorful, tender, and juicy they turn out when I use the brisket, but they will still be a huge hit with regular old ground beef! Let me tell you, the addition to caramelized onions or onion jam to your sliders is a game changer! When I made this recipe the first few times I always made my own caramelized onions. But one day I didn’t really have the time to make my own so I grabbed a jar of onion jam from the grocery store (I used this one. It was by the other jams & jelly’s) and it was equally as good on these sliders! If you cannot find onion jam, or want to make your own caramelized onions, the process is quite easy. Sliced sweet onions are cooked over low heat and stirred frequently until they turn a dark brown color and have a sweet taste. The process is quite easy but does take some time and patience! 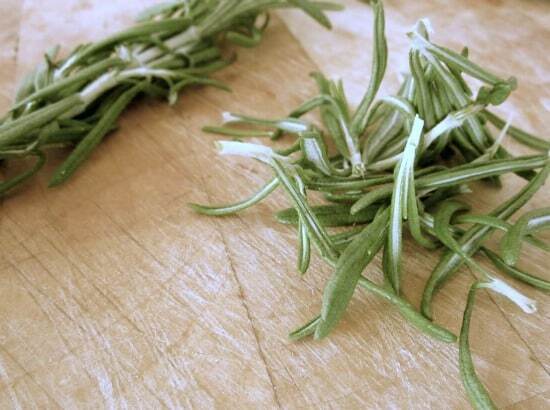 You definitely cannot skimp on this rosemary aoili as an addition to your sliders. Just give it a try! It is quite easy to make! Store-bought mayonnaise is mixed with a little lemon juice, garlic, and fresh rosemary. We just cannot get enough of it and it pairs so well with the caramelized onions! We like Kings Hawaiian Sweet Rolls for the slider buns. The sweetness and chewiness of those rolls makes the perfect vessel for the salty patty. You definitely don’t have to use that brand, but I highly suggest finding a sweet soft roll to use for your slider buns! We have tried other, more traditional hamburger bun style buns and it just isn’t the same! And there you have it! The best slider recipe in all the land! These sliders are perfect for a crowd and have wowed everyone we’ve served them to and we have served them to quite a few people! 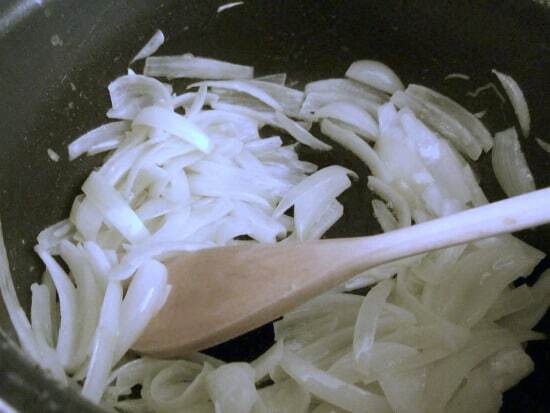 If you are making the caramelized onions, slice onions into 1/2 inch strips. Heat the butter and the olive oil in a skillet over medium heat. Add the onions to the pan and slowly caramelize, stirring frequently, until the onions are soft, brown, and jammy. Season the ground brisket (or regular ground beef) with salt, pepper and Worcestershire sauce. Give it about 3 turns in the bowl with your hands or a spoon. Lightly shape 2 oz portions into patties. Set patties aside to take the chill off while you prepare the aioli. Finely chop the rosemary. Mix the mayonnaise with the chopped rosemary, lemon juice, and garlic powder. Heat a cast iron skillet on medium high heat. Begin cooking patties in the skillet, flipping after 2 minutes. Top each patty with 1/4 of a slice of cheese after flipping and cook for another 2 minutes. Cut rolls in half and assemble burgers with all the toppings. These are just what I was thinking about doing for Super Bowl! Now I’ll try it with that rosemary mayo- sounds delicious! You’ll have to let me know what you think. We are doing these for our Super Bowl party too. Setting them up like a burger bar. Rosemary mayo takes it over the top! I know what I’m making for dinner tomorrow night. Thank you! 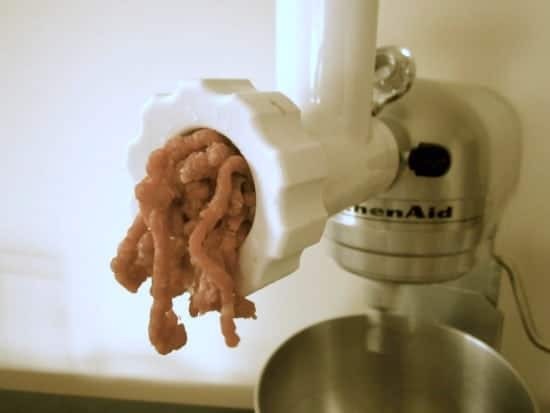 My Kitchenaid mixer came with a free meat grinder and I’ve never used it, now I am hunting for it in the back of the cabinets, your burgers looks mouth watering. LOVE the grinder attachment on my Kitchenaid. This was the first recipe I ever posted so my picture taking skills weren’t too great, but this is probably my husbands favorite recipe I have made for him. I love it too. The rosemary mayo really seals the deal for me. It compliments the meat so well. Let me know if you try it and what you think!